President Donald Trump’s campaign to rid the Veterans Affairs hospitals of dysfunction has already led to 500 employees packing up since January. 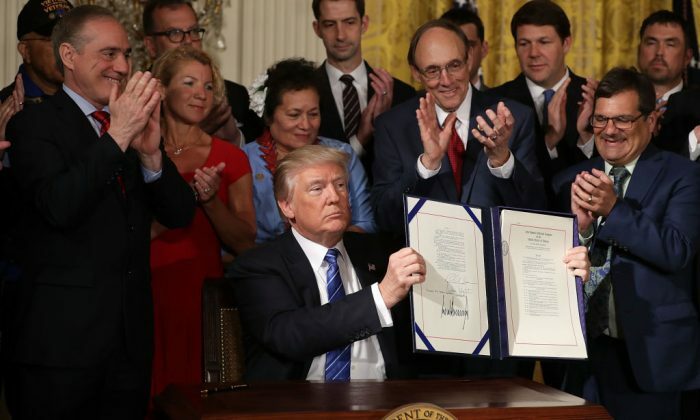 The firings started even before the president signed the Presidential Executive Order on Improving Accountability and Whistleblower Protection at the Department of Veterans Affairs. Around the time of the executive order becoming a reality, the White House launched a website to ensure that reasonable wait times were being enforced for VA appointments, and allowed the public to see what sort of wait times they can expect at their local VA branch. The site essentially ensures everything is operating up to standard. A recent report proves the extent of disciplinary measures being implemented. The website for the U.S. Department of Veterans Affairs released a list of the “adverse actions” taken this year. The list includes suspensions, dismissals, as well as demotions. The list sites the position and branch of the employee, but does not list names. Improving the operation of Veterans Affairs was a major goal for Trump since he came into office. As CNN reports, major dysfunction at the agency that cares for America’s military veterans was put into public view in 2014. A scandal about the VA’s prolonged waiting times for medical appointments being covered up caught the attention of the nation. The scandal focused on tremendous wait times for treatment at veterans hospitals, and veterans even died waiting for treatment that never came. The scandal led to the firing of former Veterans Affairs Secretary Eric Shinseki. The Phoenix VA was the focus of the scandals. They lied in records. Instead of meeting the 14-day waiting period limit for appointments, veterans’ names would be put on a secret list and never entered into official computer records. Names would be moved to the official list only after there was room on it, and that might take many months. One thousand and four hundred to 1,600 veterans were kept on that secret list. Forty veterans died waiting to get treatment. Investigations revealed many layers of misconduct. Staff didn’t come forward out of fear of being fired. That is one reason Trump made whistleblower protection a part of his executive order. The matter still hadn’t been fully cleaned up or dealt with. The same people responsible were still working in the system. According to The Hill, Trump did not want to see those involved in the scandal continue to hold their positions.